LaRouche collaborator Hussein Askary discussing Lyndon LaRouche's Triple Curve at the Schiller Institute's seminar in Sweden, May 30, 2018. 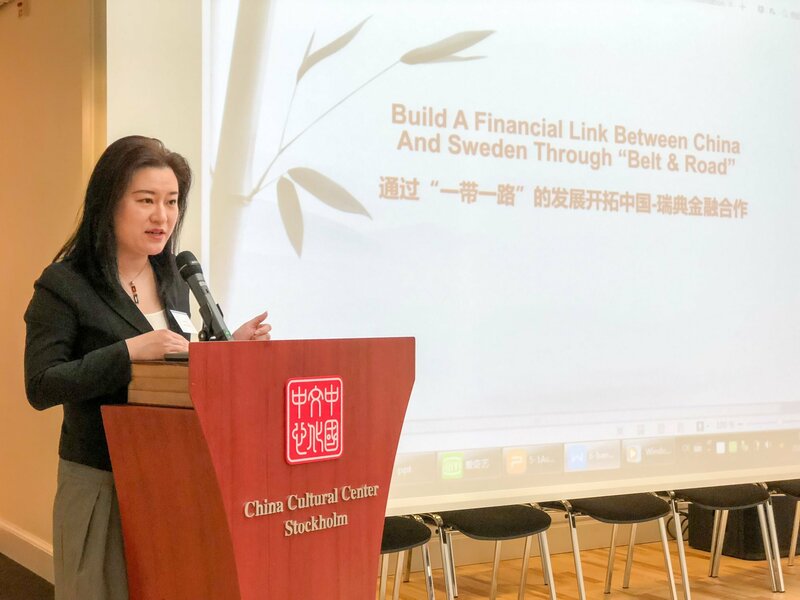 "The Significance of China's Belt and Road Initiative for World Economic Development" was the theme of a seminar hosted in Stockholm on May 30 by the Schiller Institute, the Chinese Chamber of Commerce in Sweden, and China Eastern Airlines, with the support of the Embassy of China and the China Cultural Center and in cooperation with the China-Sweden Business Council. 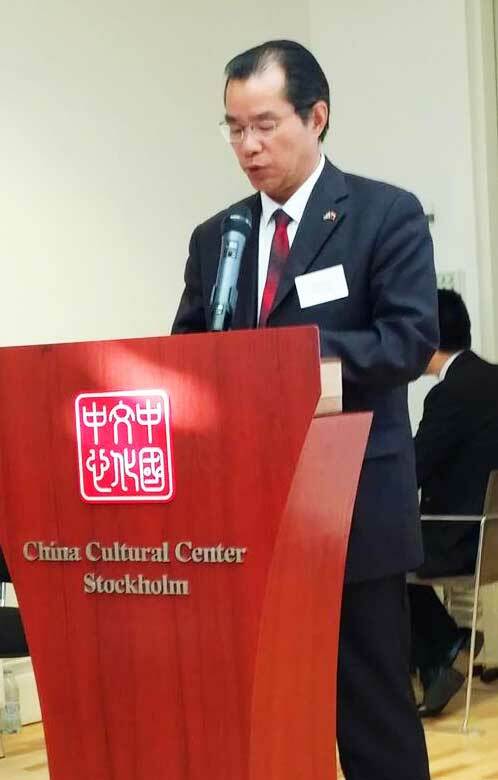 Chinese Ambassador to Sweden, Mr. Gui Congyuo. On the diplomatic level, the event was addressed by the Chinese Ambassador to Sweden, Mr. Gui Congyuo; the Ambassador of Pakistan, Mr. Ahmad Hussain Dayo; and the Chargé d'Affaires of South Africa in Sweden, Mr. Duncan Moopelo Sebefelo. It drew scores of highly motivated participants, including many diplomats, as well as representatives of Swedish industries and businesses, as well as Swedish government institutions. The diplomatic presence underscored that the New Silk Road or Belt and Road Initiative (BRI) is not just about China and Europe, but is international in scope. Mr. Gui Congyuo opened the proceedings on the significance of the BRI for global economic development, emphasizing that it is not a geopolitical project, but unites nations around a common goal of eradicating poverty and creating prosperous societies all over the world. He was followed by Stephen Brawer of the Schiller Institute in Sweden who gave a presentation on "The Strategic Significance of the BRI: Overcoming Geopolitics," which included a strong attack on "the modern form of the British Empire." 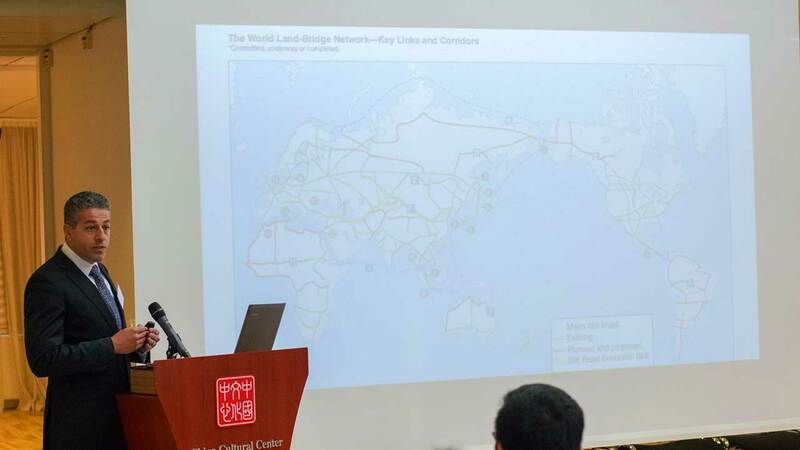 He contrasted the aim of connectivity and integrated development promoted by China to the traditional doctrine of geopolitics, as associated with Halford Mackinder's "Heartland" theory. Both in his presentation and in the Q&A discussion, Brawer challenged the Swedish government to act as an independent nation and join the BRI, as Austria did. He also called on the Swedish authorities to reopen the Confucius Institutes, whose license was withdrawn a few years ago, and convene seminars similar to this one. Ambassador Ahmad Hussain Dayo welcomed the China-Pakistan Economic Corridor (CPEC), which China is building in Pakistan from the Chinese border to the Indian Ocean port of Gwadar, which will bring immediate and long-term benefits to both his nation and also open up the landlocked neighboring countries in Central Asia, while providing a shortcut into China for the Maritime Silk Road. The South African Chargé d'´Affaires, as representative of a member country of the BRICS, presented a global perspective, and brought up the historical colonial past by referring to the Bandung Conference defining relations between Asia and Africa. Hussein Askary opened the second panel with a speech on "The Potentially Transformative Impact of the Belt and Road on Sweden, Europe and Third Parties." He presented the work of the Schiller Institute since the early 1990s in promoting the New Silk Road, and contrasted the paradigmatic shift in thinking in the West and China, by presenting LaRouche's "Typical Collapse Function" (Triple Curve) historic forecast. Askary also presented the incredible achievements China has made at home and its willingness to share that with developing countries, focusing specifically on Africa. Askary was followed by managers of various companies from China and Sweden. Tracy Suo, Deputy General Manager of Bank of China Stockholm Branch, presented the impact of the BRI policies on today's economy. Two Swedish consultants presented ways and means to develop business, especially production and infrastructure, between China and Sweden. The head of China Eastern Airlines, who sponsored the seminar, presented his expanding airline network between Europe and China/Asia. During the discussion period, Ulf Sandmark, a leader of the Swedish Schiller Institute, brought up the model of Swedish Chinese industrial cooperation experience from the Volvo Cars success story, calling for extending this model of Swedish-Chinese innovative industrial cooperation to the BRI projects in Africa. This seminar came amidst a major mobilization in the media and think tanks against the BRI, describing China as a new hegemon in the world. An unprecedented number of seminars on the theme have been, and will be held around on June 4th, when a new state-backed think tank, the New Silk Road Observatory, will be established amid a lot of fanfare. The Schiller Institute Seminar is the only one with a positive and constructive tone. In answering questions, the Chinese Ambassador told the audience to ask the Schiller Institute if they had questions about the Belt and Road, because they have the best knowledge of it.